There have been conversations -- some quite animated -- over the years about whether or not it's ok to alter vintage clothing. Long gowns cut top shorter lengths, sleeves cut, and the like have upset lovers of vintage style, who cry out at the inappropriateness of it all. These same people say that these are pieces that should be saved for posterity, despite the fact that most textiles are not stored properly to protect them. Most of the time, these are the same people who wear vintage --- and that's the worst way to preserve these precious textiles. Mind you, I am not against people wearing vintage. Quite the contrary: I LOVE vintage clothing, and the more people wear it, the better in my book. Yes, there are some true museum pieces, like a Charles James gown, a vintage Dior, or even some Ceil Chapmans. I'd love to see the fun novelty prints saved, like Alex Colman and Vested Gentress, and the daily wear styles like Anne Fogarty and Jonathan Logan. Au contraire -- I love it when vintage is saved intact. There's nothing worse than seeing some poorly (and completely inappropriately) inserted corset, put into a 50s gown where it doesn't belong. And a ball gown trimmed to a mini just isn't right, if for nothing other than the fact that the proportions are altered so as to look wrong, most of the time. One does need to use judgement in these things. That being said, I came across this article in the November, 1950 Woman's Day magazine, and it is just perfect for proving the point that people have been renovating their clothing for years, so we are really no different. 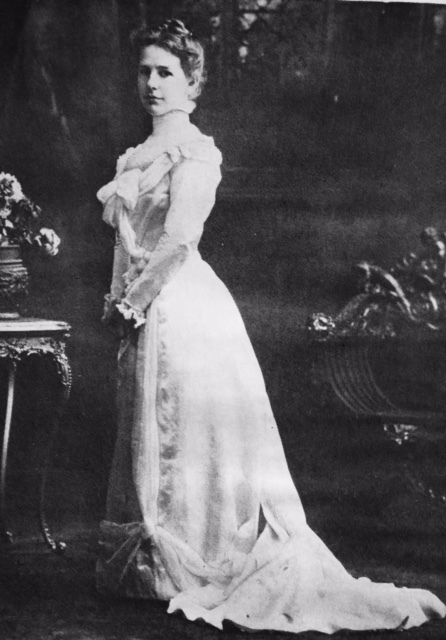 This gown was originally worn in 1900. It is constructed of pure satin. 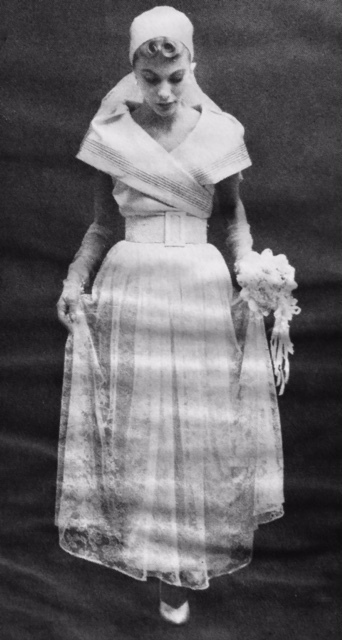 When her grandson's wife prepared to marry, they used the train and skirt to create a fashionable dress for the wedding 50 years later. The bottom half of the train was used to create the bodice, complete with a tucked border that was part of the original trimming. The collar was cut from one long side of the train, tucked at the shoulders, and then attached to the bodice. The ends were then crosed over the front, creating a surplice effect. Facings were made from bias strips. The original skirt's waistband was removed. The skirt then became an underskirt in the new gown. The underskirt was stitched to the bodice, and a side zipper was added. 4 1/4 yards of oyster white lace and 1 1/4 yards of veiling was purchased. The overskirt was made by cutting the lace crosswise into four equal pieces. These were seamed together, gathered at the top, then attached to Grandma's waistband and hemmed. The headband was made from a piece of the train, then lined with taffeta from the original train lining, then the two ends were joined. The veiling was tacked to the back of the headband, so the veil could be worn either over the face or folded back, as shown. The veiling and gloves were soaked in tea about an hour, to create a tint that matched the dress and overskirt. All in all, an excellent use of vintage clothing to create another stylish garment. The original dress may have been fortunate to survive the years, given the calling for fabric during World War II. That means that there may have been those in 1950 who cried out to save the original dress. I could totally understand their concerns, but when it was used to create a beautiful heirloom garment, who could argue? I'm not sure how I feel about it. What do you think? I agree it was an excellent use of the fabric, could be considered a homage to the quality of fabric available. The only other way of utilizing the fabric that would have suited me was an heirloom baptismal/christening gown, which I understand is where many bridal gowns ended - or rather began a new life! Much better than cutting it up for a quilt or doll clothes. AMEN! I too have mixed feelings when it comes to some vintage garments being cut up. However, a few well-placed alterations can take a questionable style with fantastic fabric from unwearable to strikingly chic. When I married, I had my grandmother's 1940s candlelight satin gown, but she was a teensy weensy lady and I'm a buxom size 14. I used only the button band down the back and concocted a vintage style dress around it in new silk dupioni and antique laces. Yes, Grandma's dress has a hole in the back now, but I feel it was definitely worth it.